An unusual combination to Sgt Hambridge, ASC. Picture courtesy of Dixons Medals. 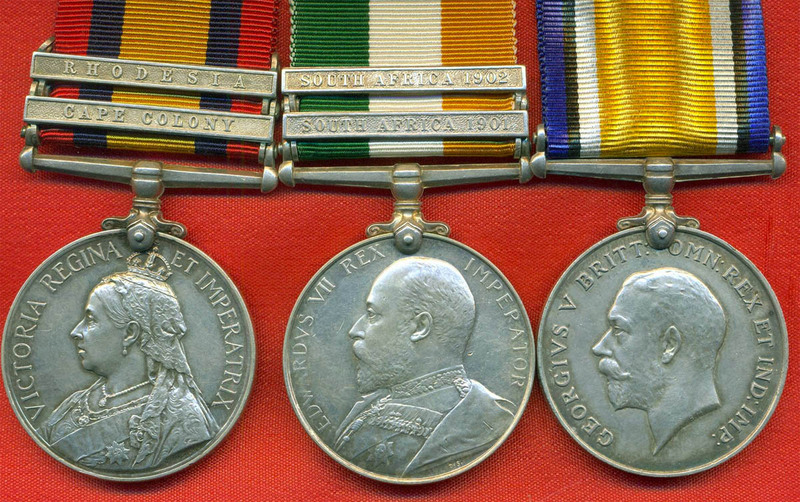 All medals and clasps confirmed for the Boer War whilst serving with the 38th Company Army Service Corps. Francis Disney Herbert was born on 18th April 1862 in Hackney, London, the son of William Herbert and Ellen Herbert, nee Girling. Having emigrated to South Africa, and joined the South African Colonial Forces with the Duke of Edinburgh’s Own Volunteer Rifles, and having been commissioned as a Lieutenant, he then saw service during the operations in Basutoland which lasted from 13th September 1880 to 27th April 1881. In all only 1589 medals with this clasp were issued for Basutoland, with 187 going to men of the Duke of Edinburgh’s Own Volunteer Rifles. Returning to London, he married Adela Potter-McQueen in Marylebone on 5th September 1887, and the couple had two children. At the time of the birth of his second child, a son, in Paddington, Herbert is shown as serving as a Lieutenant with the 9th Middlesex Volunteer Rifle Company, King’s Royal Rifle Corps. Having then returned to South Africa, with the outbreak of the Boer War, he was appointed as a Lieutenant into the Army Service Corps, and then saw service with the 83rd South African Company, on operations in Natal during the period from 11th October 1899 to 11th June 1900, and later in the Orange Free State and at Belfast on 26th to 27th August 1900. Herbert was later promoted to Captain and was at Vryburgh in April 1901, and then took part in operations in the Orange River Colony from December 1901 to 31st May 1902. He is also noted as having briefly seen service in the Cape Colony and the Transvaal at various dates. Herbert was ultimately appointed as a Captain to the 3rd Militia Battalion, Leinster Regiment, on 22nd June 1903, but left this regiment on 24th September 1904. Herbert then went back to work as an Insurance Agent and moved to Johannesburg in September 1903, but ended up with marital difficulties when his wife left him, their children being then aged 17 and 14 respectively. She refused to return to him and did not return even for the court hearings having moved back to London, and a divorce was issued to him in May 1906. However in her defence, his errant wife then wrote to confirm that she had left him due to his having an affair with a women, known as Betsy Bell. Herbert clearly was having an affair, as he then married for a second time, Lilian, nee Bell, clearly the woman known as Betsy, in London in 1906, and then returned with her to South Africa where he lived in Johannesburg. With the outbreak of the Great War, he was then granted a commission as a Captain into the South African Service Corps on 2nd September 1914, and after service during the German South West Africa Campaign, was released from service on 21st December 1914. Alfred Ernest Sincock was born in Aden in September 1879, and was educated at Taunton’s Trade School, Southampton. A Clerk by occupation, he enlisted into the Army Service Corps at Guildford, 12 August 1898. After nearly 19 years service in the A.S.C. and Army Reserve, Sincock was discharged as a 2nd Corporal, having completed his first period of service, 11 August 1910. With the onset of war he re-enlisted at Southampton, 16 September 1915. As a Temporary Staff Sergeant-Major Sincock entered the Salonika theatre of war, 12 September 1916. He was appointed Temporary Warrant Officer Class 1 in September 1915 and was commissioned Temporary 2nd Lieutenant in February 1918. 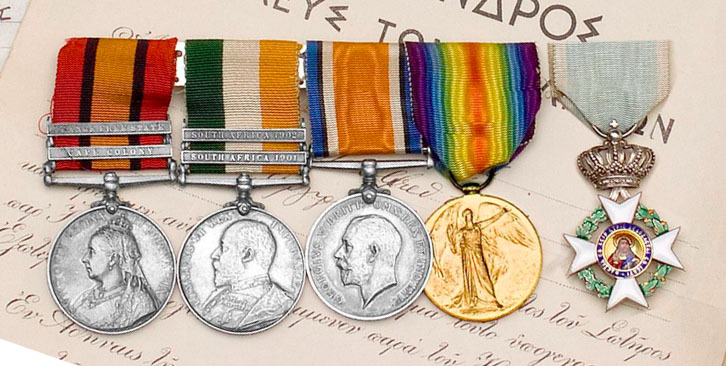 As an officer he was awarded the Order of the Redeemer by the King of the Hellenes for his service in Salonika with the 16th British Corps who were for a time attached to the 2nd Greek Division. During the period July-October 1918 he held the local rank of Captain. Sincock relinquished his commission, whilst retaining the rank of Lieutenant in 1921.